Uzi Meshulam, who led a fanatical group in the 90s which called for the investigation of the Yemenite Children Affair, died on Friday in the Meir Hospital in Kfar Saba, aged 60 years old. "It's a loss to all the people of Israel, because Uzi did not fight a personal war, but for all of Israel," an associate said. "Those who don't identify with his struggle aren't Jewish." Meshulam's funerary procession will depart Friday noon from his Yahud home. Though styled "rabbi" by his followers, Meshulam was never ordained. Meshulam began his public career in the early 70s, when he demanded a probe into the truth behind the mysterious disappearance of children, offspring of Yemenite immigrants, between 1948 and 1954. Along the years, Meshulam became the center of a group a devoted followers and set up the Mishkan Ohalim yeshiva in Petah Tikva. Until 1994 his exploits were not widely known outside the Yemenite sector, but in Passover that year Meshulam barricaded himself with dozens of followers in his Yahud home, fully stocked with weapons, and demanded a State inquiry into the Yemenite children. The barricade initially began as a small neighbors' dispute. Meshulam's Yahud home became a pilgrimage site after he released his first pamphlet on the Yemenite children affair, and dozens came to deliver their testimonies, as well as study Torah. One day a dispute broke out with a contractor, building a house nearby, and he called the police. Starting as a minor incident, the conflict quickly developed into a dangerous standoff with dozens of armed followers on the one side, and dozens of police officers on the other. Meshulam and his followers barricaded themselves for a month and a half, surrounded by snipers and special police forces. The affair won extensive media coverage and was at the top of the public agenda. Finally, in May 10, 1994, Meshulam was lured out of the house to meet then Police Chief Assaf Hefetz, and police officers managed to overcome the followers and take control of the house, though one of Meshulam's disciples was killed in the shootout. Meshulam was accused of conspiring to perform a crime, disrupting a police officer in the course of his duty, attempted sabotage with intent (firing at police), threats, endangering human life with intent and producing and holding weapons illegally. Meshulam was sentenced to eight years in jail and several of his followers were also imprisoned, for terms running between a few months to five years. 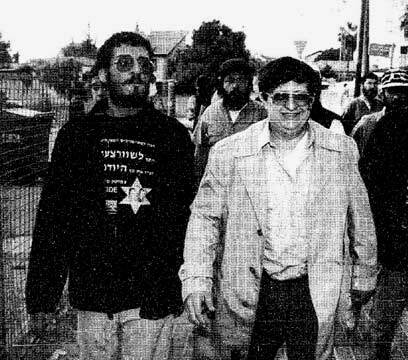 Meshulam's sentence was shortened by then president, Ezer Weizman, and he was released after five years. Due to his deteriorated state of health and limiting conditions of release he never returned to public activity. "He went to jail in perfect health and came out on a stretcher," an associate recalled, and noted that since his release his condition rapidly worsened. "That’s not how it should have been. He came out of jail in very bad health." See all talkbacks "Uzi Meshulam, who led campaign to probe Yemenite Children Affair, dies"